Well, today is the day you will find out! When we are dreaming up names for a new coffee, we are always looking for names that are fun and playful. Why? Often the world can be too serious and sometimes a new product that you haven’t tried before can seem a little daunting. By naming our coffees silly, or stupid things makes them memorable and, hopefully, approachable! To start, our long forgotten, but original line up of six single origin coffees were mostly named around the time of day we crafted them for. For instance, ‘Must Dash’ and ‘Morning Glory’ were crafted for the morning. 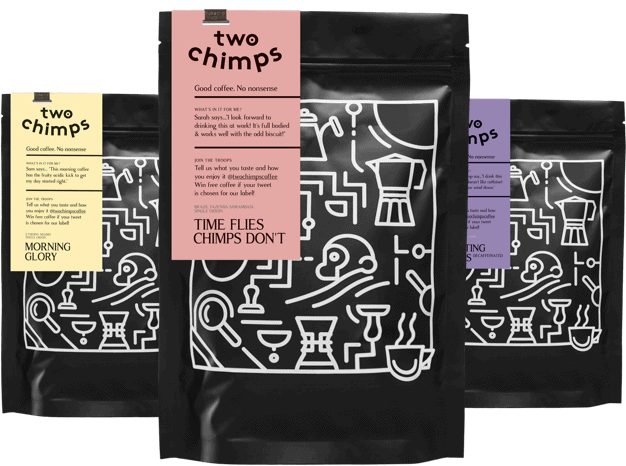 ‘Time Flies Chimps Don’t’ and ‘The Bearded Auntie’ were crafted for the daytime. ‘Pyjama Party’ and ‘Counting Chimps’ were crafted for the evening. We try to dream up clever and unique names for our coffees. A lot of the names we’ve had in the past and, will no doubt choose in the future, are a ‘play on words’. Rather than naming a coffee by its country of origin, we prefer to give our coffees more memorable names that hopefully give you, our customers a reason to try our coffee. We always try and make our names as relatable as possible. For example, everyone has an Auntie with a beard. Right? Currently, Some of our names do relate to the country of origin, but we have made them as fun and as individual as possible. Take one of our latest coffees ‘How Many Is A Brazilian?’ as an example. Any guesses as to where this coffee comes from? Want to name a coffee? During our ‘Create Your Own Blend’ course, we encourage people to come up with comical names for their blends. One of our recent favourites was a custom blend named ‘Jamaican Me Crazy’. The team at Newton Fallowell Estate Agents created another example of an awesome coffee name. They went through every process of creating a new blend, from cupping to naming. The name they chose for their blend is ‘I Like The Way You Move’. Their custom blend is sent out to every client of theirs that successfully buys a house from their Oakham or Stamford branch. The names of our coffees make up just a small part of what our business is all about. Delivering awesome coffee while putting a smile on a few people’s faces. So there you go, that’s how we come up with the crazy and wonderful names for our coffees. No alcohol involved, just good ol’ brain power. Sometimes ideas for coffee names come straight away, and other times we have to rely on our trusty board. The board has lots of names that have come from you lovely lot.